“I kept saying, ‘You’re going to get another shot,” Taj Gibson said he told his long-time teammate. Twenty-nine seconds later, Rose proved Gibson prophetic. T.J. Warren led Phoenix with 21 points and Booker and Kelly Oubre Jr. each added 18. Warren’s last-second corner 3 hit off the side of the backboard. The Suns lost all four on their trip to fall to 4-20 on the road this season. A night after losing by 20 in Charlotte, Phoenix shot 46 percent, but went 22 of 32 from the line. Suns: With C Deandre Ayton (ankle) and F Richaun Holmes (foot) out injured, Bender made his first start of the season and had 12 points and 10 rebounds. “Drag was phenomenal,” Warren said. “I’m happy for him.” … Veteran guard Jamal Crawford, who played last season in Minnesota, was active and on the bench for his 1,300th career game. He missed the previous three games with a sore left knee. “His experience, his voice, his presence, the wisdom he’s sharing in the locker room when the coaches are not around, it’s priceless for the group and we’re thrilled to have him,” Kokoskov said before the game. 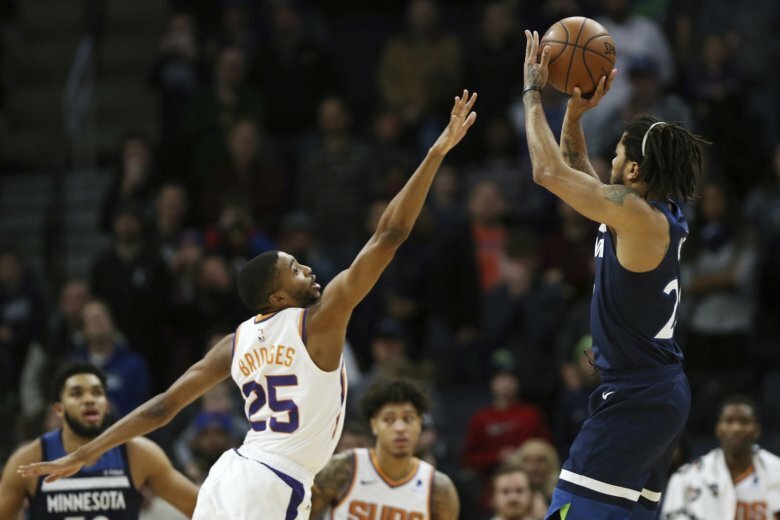 Timberwolves: Towns notched his 10th career game with 10 or more made free throws. He also matched his career high with four steals. … F Robert Covington (bruised knee) and G Tyus Jones (ankle) remained out.